Keep toes toasty and fairytales alive this winter with adorable children's unicorn slippers! 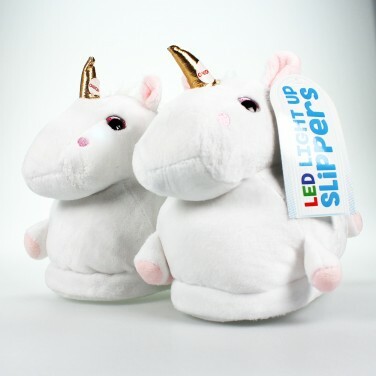 With a flowing rainbow mane and tail and golden horn, these cute unicorn slippers will keep kids cosy with their soft white plush, and better still, one squeeze of the horn lights up the cheeks of each slipper with magical colour change effects! Available in size 11-4, these cuddly slippers will be a big hit with kids of all ages and the envy of grown ups!